Image caption Frank Murray gave the families of the Disappeared "reassurance that they would not be abandoned"
Frank Murray, one of the commissioners who worked to establish the burial locations of the Disappeared, has died. The Irishman was appointed to the Independent Commission for the Location of Victims Remains (ICLVR) in 2006. It was set up to locate the bodies of 16 people who were abducted, murdered and secretly buried by republicans during Northern Ireland's Troubles. Mr Murray, who was in his late-70s, died on Saturday morning. His fellow commissioner Sir Ken Bloomfield was among those who paid tribute to him, saying it had been a privilege to work alongside him. Sandra Peake, who works with the families of the Disappeared through the Wave Trauma Centre support charity, said he had given them "comfort and reassurance that they would not be abandoned". "His sincere commitment to doing all that he could to end the suffering of the families of the Disappeared was clear to everyone who met him," added Ms Peake. The Irish Justice Minister Charlie Flanagan said Mr Murray had been a "most dedicated and distinguished public servant". Mr Murray had been a long-serving senior civil servant in the Republic of Ireland and served as the general secretary to the Irish government for a seven-year spell until 2000. He held that position during the period that led to the signing of the Good Friday peace agreement in 1998, which brought an end to the Troubles. "With the sad death of Frank Murray Ireland has lost a great man in terms of public service and sheer public decency," said Sir Ken. "His distinguished career in the Irish civil service was in itself notable but in our joint efforts to recover remains he did his utmost to ensure a Christian burial, however belated, for many grieving relatives. "He will be greatly missed by all who benefited from his wisdom and unalloyed decency." 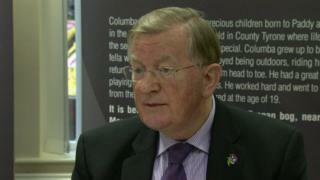 Last Sunday Mr Murray attended a service for the relatives of the Disappeared in St Patrick's Cathedral in Armagh. Since 2006, he and Sir Ken had overseen the recovery of eight victims, the most recent coming last year when Seamus Ruddy's body was found in northern France. Three victims have yet to be located. Mr Flanagan said Mr Murray had a "particular commitment to the cause of the Disappeared" and gave "unstinting support" to their families. "In all of his work Frank was a consummate professional and a perfect gentleman," he added.